This pack includes a Bob-omb mover that entirely transforms you from your regular avatar into the crazy lil' Mushroom Kingdom critter. This mover uses v4 objects (mover, particles), so make sure you have v4 rights in the world your are building this in. This mover is saved as an Object Group, so place the base object where you want the center of the Bob-omb to be. There is only one North-facing file in this pack. If your Bob-omb doesn't work for you, select the Mover control object and make sure it has Linking Enabled. 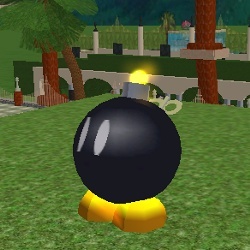 When the Bob-omb is built initially, the eye objects may be indented into the body a bit. Adjust the eye objects with precise movement as needed. 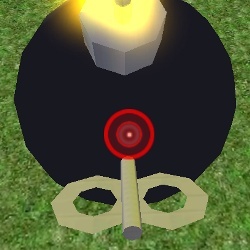 While touching the back part of the mover with your avatar, click the area as shown below. Remember, it will not work if you are not touching the back part of the Bob-omb with your avatar.